Bullet journal or Bujo (for short) have recently gotten very popular. It’s basically an essential planner, diary, tracker, and organizer all in one. It’s meant to keep you organized and in order in a very aesthetically pleasing way. It basically takes stationery and note ideas to a whole new level. That said, here are some of the awesome journal ideas to inspire you. They’re really cute and effective help for keeping organized even on your busiest days. So check them out below and let me know what you think! This bullet chore routine will keep you on top of cleaning even on your busiest day. It can also make for a more pleasant cleaning session. Creating your weekly to-do list will definitely make your week organized and in order. Try out this colorful and fun bullet journal to add some fun and cuteness to your weekly routine. This stencil journal is an easy way to have consistent journal layouts. And this is really perfect for all the bookworms out there. 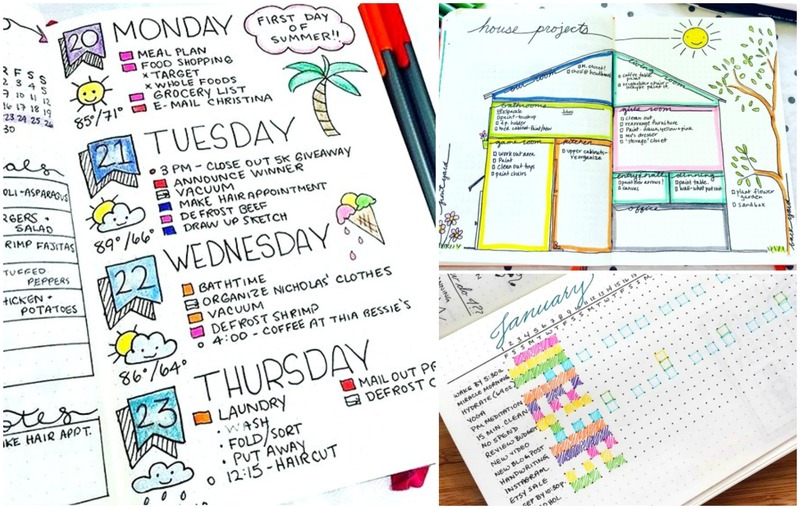 This home project journal will help you better visualize your dream house! It’s super cute and so easy to create. If you want to keep track of your habits, consider having this awesome tracker. You can even schedule a task ahead of time by creating an empty box and fill it after you’re done. I think this one’s my favorite! I seriously love this bucket list journal from Abbey Sy. It’s so personalized, stylish and very artistic. I think this one’s good for those who have an eye for aesthetics. Whether you want to keep an eye on your spending or your earnings, this budgeting journal will be a great help. It’s very systematic and functional, helping you spend less and save more. If you like to do simple meal prep ahead of time, then this journal is totally for you. No need to create a new meal plan sheet every week, the post-it-notes have you covered. The bullet journal addict came up with this beautiful morning routine journal. Having one like it will organize and make your morning run smooth. Whether you want to create a full to-do list or a calendar, reminders or doodle, space or whatever, these bullet journal ideas are here to inspire you! If you have any questions about them, just let me know! I’ll be glad to answer them!